The SPG600 and SPG300 Sync Pulse Generators provide synchronization and test signals for both traditional analog and mixed digital and analog facilities, in both NTSC/525 and PAL/625 environments. 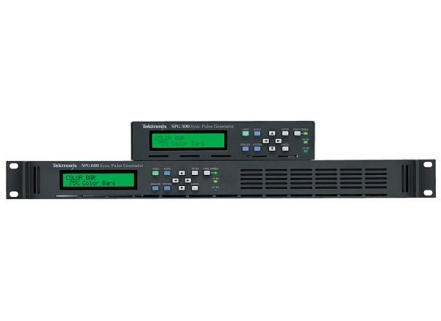 These products are ideal as a stable master sync signal, which is critical in digital broadcast environments. When the SPG600/SPG300 is configured for Stay GenLock mode, a momentary loss of synchronization at the genlock reference input will not cause a disturbance in the unit's test signal and black outputs. When the genlock signal is reapplied the SPG system will gradually reacquire lock, causing little disruption in the outputs of the device, and will not cause any noticeable glitches in the outputs of the SPG. The Genlock source can be NTSC/PAL Black Burst, NTSC/PAL Sync, or CW. When using CW lock, the Genlock timing can be adjusted on all the NTSC or PAL color frames.